Three recent grants have been awarded by the National Science Foundation to Prof. Horea Ilies to support the current research in his Computational Design Laboratory. The ability to measure how well objects “fit together” is a key task in engineering design and manufacturing as well as in the broad scientific arena whenever the behavior and function of a system is dependent on proper geometric alignment. For example, assembly planning from macro to nanoscale, layout optimization and packaging, design for human variability, synthesis and self-assembly of nano-machines, novel drug design, comparative shape analysis (shape similarity), as well as personalized medicine and medical devices are all applications in which the system’s behavior and function depends on the proper geometric alignment of individual components. One of the grants, based on the work with Dr. Morad Behandish, focuses on developing a generic framework for geometric interfaceability in virtual product development aimed at quantifying and interpreting how well objects of arbitrary geometric complexity fit together. A second grant is exploring the extension of the geometric interfaceability framework to develop effective haptic interaction mechanisms for intelligent human-computer or human-robot systems with a focus on virtual assembly tasks. The research uses haptic devices, which add the sense of touch when interacting with digital models and simulations, and are used in a variety of research, industrial and consumer applications, from engineering design, to computer-assisted surgery, and gaming. The latest NSF-grant received by Prof. Ilies, in collaboration with Dean Kazem Kazerounian, focuses on the systematic design, analysis and control of manufacturable nanomachines such as the nanorobots built from protein molecules. In this research, Profs. 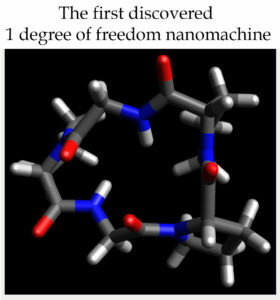 Ilies and Kazerounian aim to develop a theoretical and computational framework to systematically design, and analyze self-assemblable molecular machines with prescribed mobility and function obtained from a predefined library of molecular primitives. The research aims to develop the tools required to perform design space explorations for synthetic and controllable molecular machines and devices, potentially leading to novel molecular motor functions that can be used to develop smart nanorobots and materials.